"Emmet Fox The Modern Mystic." Here is a portion of chapter one for you to review. In July of 1886 Vega, a brilliant star that lit up the sky could be clearly seen in the northern hemisphere. Considered the most important star in the sky after the sun, Vega is easily recognized for its brilliance and clarity. To ancient Babylonian astronomers Vega represents one of the "Messengers of Light." On the 30th of July in that year, in the small village of Cove, Ireland, as the star Vega cast its brilliant light among the twinkling stars in the sky, a baby was born, a true messenger of light who would one day give the world the keys to greater spiritual living. He was named Joseph Emmet Fox. He was one of three children, including an older sister, Nora. Emmet, as he would be called, received the sacrament of Baptism, initiating him as a child of God. From an early age, Emmet Fox had an intense interest in astronomy and the galaxy's billions of stars. He was thrilled by the grandeur of the universe and the hundreds of billions of galaxies in the universe. For most of recorded history, humans believed that God created the ordered universe out of chaos. This belief is still shared by a majority of people around the world, but Emmet Fox believed that the universe was one of cosmic order. When he completed his elementary education in England, he read widely and deeply about the universe, and learned under the wing of a retired professor of physics and astronomy. Later in life, his interest deepened, with his focus on the phenomenon known as the Precession of the Equinoxes. The Precession of the Equinoxes is the gravitational forces of the Sun and the Moon, and to a lesser extent, other bodies on the Earth. It is the observable phenomenon of the rotation of the heavens, a cycle which spans a period of (approximately) 25,920 years, over which time the constellations appear to slowly rotate around the earth. It was first explained by the great mathematician and scientist Sir Isaac Newton. In approximately every 2,156 years, there is a shift into a new astrological sign, which ushers in a new age. We have been in the Age of Pisces which focuses on religion, spirituality, religious wars, crusades, and religious freedom. We are presently at the dawning of the Age of Aquarius. There is no definite date known to man as to when that will transpire. The Age of Aquarius focuses on accepting oneself as a whole person. Judge Thomas Troward, the English author whose works influenced the New Thought movement and mystic Christianity, stated that a man's life must always be the exact reflection of that particular stage which he has reached in the perception of the divine nature, and of his own relation to it. As we approach the full perception of Truth, the life principle with us expands. From this perspective Emmet Fox came into this life to bring insight into the mysteries transcending ordinary human knowledge, as by direct communication with the Divine. His self-surrender to obtain unity with God-Mind beyond the intellect brought him to a mystic way of life. Fox never referred to himself as a mystic, but his intimate union with the Divine, along with his contributions to spiritual interpretations of the scriptures, gives him that status. On September 6, 1933, Emmet Fox delivered a talk at the famed Victoria Hall in London. The substance of the lecture was the twelve symbols or signs of the Zodiac, which he called the Cosmic Clock. The Bible, he said, has the Zodiac running through it from the beginning to end. There were the twelve sons of Jacob, who became the twelve tribes in the Old Testament, and the twelve Apostles of the New Testament. Then there were the twelve Tribes of Israel in strict astronomical order in the great encampment in the wilderness, a true example of Zodiac symbolism, which the reader can verify for himself. In his writings of the Four Horsemen and the Apocalypse, he states that it may seem strange to the reader that the Signs of the Zodiac should be brought into this at all, but, of course, we have to take the Bible as we find it. The book of Revelation, often referred to as the Apocalypse, was written in complicated symbolism and has been greatly misunderstood. Why would the word of God be given symbolically? The answer is that symbols are the universal language of all people in all ages. Symbolism transcends language. Fox tells us that the Book of Revelation is not intended to foretell what will happen to nations or people. It is a book of prophecy of what will happen to the individual soul. The Apocalypse contains blueprints for personal living. These things are in the Bible, and it is our business to interpret the Bible rather than to think it should be written in some other way. It was during that Victoria Hall lecture that Emmet Fox predicted world changes that took place five years later. He also spoke of significant changes in history, changes that would affect our religious freedom and bring about an erosion of individual rights. Because we are approaching the Age of Aquarius, we see people all over the world fighting in what we call "religious wars. "Fox made some extraordinary predictions of events which he said would happen around the midpoint of the age of Pisces, and the coming of the new Age of Aquarius. During a question and answer period, after one of his lectures in the United Kingdom, Fox made a statement, that there would be a "technology addiction in the 21st century." Researchers at the University of Glasgow, in a recent study discovered that most folks check their e-mails every hour and fifty percent of those studied, check their e-mails thirty and forty times an hour. They also reported that nearly ninety percent of all Americans actively use some sort of computerized device. Regarding religion, Fox stated, "God and heavenly Father will be denied or forbidden in places other than churches," and "prayers would have to be in secret." In 1962 the U.S. Supreme Court removed prayer from the nation's schools. Fox also spoke about chaos and war in the Holy Land. In his book Diagrams For Living, he writes that by expanding the horizon of space, man will not only discover that God is God of the human race, but the God of the universe, and of many other races scattered throughout the cosmos. In a recent CNN report, scientists are said to be theorizing about life on other planets. Scientists recently announced the discovery of three planets that are the best candidates so far for habitable worlds outside our own solar system and they're not very far away. As the individual opens his heart to the Christ, he will understand more completely his relationship to God and the cosmos, and especially will he realize that the earth with its inhabitants is not an island unto itself. Jesus, far-seeing seer, gave a hint. He said, "I have other folds that you know not of." "And now" Fox said, "We are on the threshold of knowing." Why would the word of God be given symbolically? The answer is that symbols are the universal language of all people in all ages. Symbolism transcends language. Fox tells us that the Book of Revelation is not intended to foretell what will happen to nations or people. It is a book of prophecy of what will happen to the individual soul. The Apocalypse contains blueprints for personal living. These things are in the Bible, and it is our business to interpret the Bible rather than to think it should be written in some other way. It was during that Victoria Hall lecture that Emmet Fox predicted world changes that took place five years later. He also spoke of significant changes in history, changes that would affect our religious freedom and bring about an erosion of individual rights. Because we are approaching the Age of Aquarius, we see people all over the world fighting in what we call "religious wars. "Fox made some extraordinary predictions of events which he said would happen around the midpoint of the age of Pisces, and the coming of the new Age of Aquarius. During a question and answer period, after one of his lectures in the United Kingdom, Fox made a statement, that there would be a "technology addiction in the 21st century." Researchers at the University of Glasgow, in a recent study discovered that most folks check their e-mails every hour and fifty percent of those studied, check their e-mails thirty and forty times an hour. They also reported that nearly ninety percent of all Americans actively use some sort of computerized device. Regarding religion, Fox stated, "God and heavenly Father will be denied or forbidden in places other than churches," and "prayers would have to be in secret." In 1962 the U.S. Supreme Court removed prayer from the nation's schools. Fox also spoke about chaos and war in the Holy Land. In his book Diagrams For Living, he writes that by expanding the horizon of space, man will not only discover that God is God of the human race, but the God of the universe, and of many other races scattered throughout the cosmos. In a recent CNN report scientists are said to be theorizing about life on other planets. Scientists recently announced the discovery of three planets that are the best candidates so far for habitable worlds outside our own solar system and they're not very far away. As the individual opens his heart to the Christ, he will understand more completely his relationship to God and the cosmos, and especially will he realize that the earth with its inhabitants is not an island unto itself. Jesus, far-seeing seer, gave a hint. He said, "I have other folds that you know not of." "And now" Fox said, "We are on the threshold of knowing." We are moving toward this awareness, and the constructive shift for peace, freedom and enlightenment which would happen in the Aquarian age. We are not far from that midpoint at this very moment in time, and we are already experiencing the predictions he made eighty years ago. The central purpose of his lecture was to raise consciousness, thereby raising the consciousness of humanity. We are here to learn the Truth of Being, to become self-conscious, self-governed entities, focal points of the Divine Mind, each expressing God in his own way. This is the object of our existence and the only thing we have to do is realize it and get a better knowledge of God. The age of Pisces is represented by a fish. The fish is a symbol of wisdom, knowledge of the All ness of God and the power of prayer. Fox explained that fish (like the Presence of God) live in the depth of the waters (the human soul) and must be sought with patience and gentleness to be obtained. Among Christian followers, the symbol for Christ is the fish. Emmet Fox said, "The great world teacher of the New Age is not to be any individual, textbook or organization, but the Indwelling Christ." As for individuals, their fate depends on one thing: the condition in which they keep their consciousness. The only real protection is the practice of the Presence of God that manifests itself in mental peace and good will toward all. Many were his visits to the monumental, seventy-one foot high, two hundred ton obelisk referred to as Cleopatra's Needle, located in New York's Central Park, inscribed with Egyptian hieroglyphs. Emmet Fox told his friends that it was impossible for him not to feel a thrill realizing that Moses himself often looked at this very same column, resting his eyes upon this ancient monument. It was old even when Moses first looked upon it, reading the story of past greatness. It is interesting to note that outside the great Temple of the Sun at Heliopolis, where Moses was a priest, there stood four great obelisks representing the four great elements: fire, earth, air and water. The priests would see them every time they passed in and out, and the location of the obelisks at the entry implied that this knowledge was the portal to the understanding of God. In the intervening centuries these columns have relocated, one of them to Central Park, New York. Others are in Paris and London. As Emmet Fox looked up at the column towering over him, he thought of how people forget that material conditions are always changing, and that the only permanent thing is God and His self-expression. We are the expression of God. This great pillar came out of Egypt, as the children of Israel once did, to bring a message of hope and a key to wisdom for all to see. Fox made note that the obelisk was made of red granite. In the Bible certain materials are considered noble; granite is one of them. It is not man-made of clay, but a rock of strength and stability. This tall, four-sided monument ends in a pyramid-like shape at the top. The pyramid is a sacred symbol representing balance of harmony and unity, when the building blocks are completed; in the same manner man experiences harmony and oneness when he comes into a realization of the Truth of Being. Fox tells us that these physical objects are very beautiful, but such beauty is really Spirit or Truth shining through. In his detailed observance and interpretation of the hieroglyphics, he was certain this obelisk standing tall in Central Park contained a sacred message. 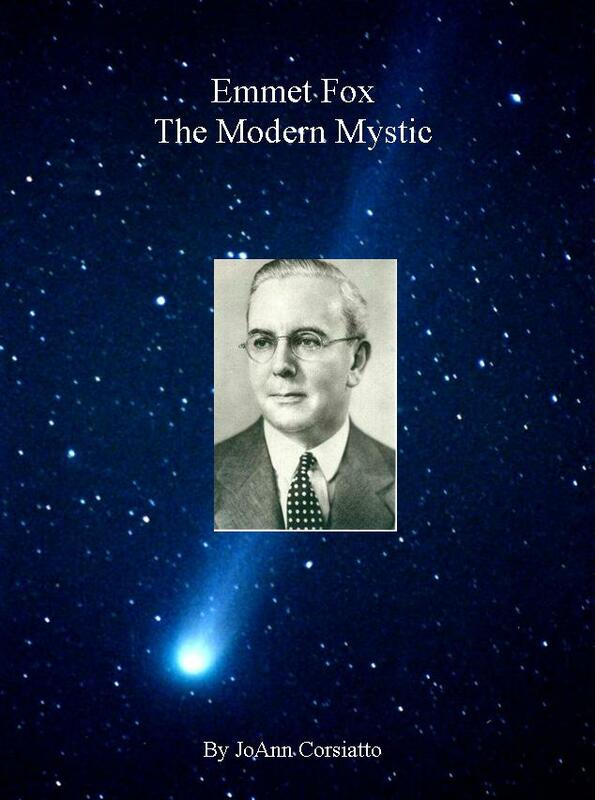 Emmet Fox: The Modern Mystic is a thought-provoking, informative, compelling, and -at times-controversial study of one of the most gifted New Thought teachers of our time. This book takes an in-depth look at the mystic consciousness of Dr. Fox - his clear vision and ability to heal; his predictive powers and brush with quantum events which transcended time and space; his unexplained knowledge of events that occurred centuries earlier; "The real is so wonderful." he said, "it will stagger the imagination." This book explores a deeper dimension of this great man than previously revealed and illumines a corner of his life known to only a few. Congratulations of your new book "Emmet Fox the Modern Mystic." It is well written, well researched and thought provoking. As I journeyed through the text I developed a sense about Emmt Fox making me realizing what an amazing gift he was to life, and to those of us who know of his work. It gave me a sense of hope and how open-ended life really is. I actually found myself reading the last two chapters more slowly, as I did not want to come to the end of the book. This is probably the best book I have read in awhile. Thank you for it.